Alternative rock fans, get ready for the show of the year!! That’s right, its The Cult, Stone Temple Pilots and Bush on a massive shared tour around North America. Dubbed the Revolution 3 tour, this epic trio are on their way to the San Manuel Amphitheater for Saturday 1st September 2018 – be there!! 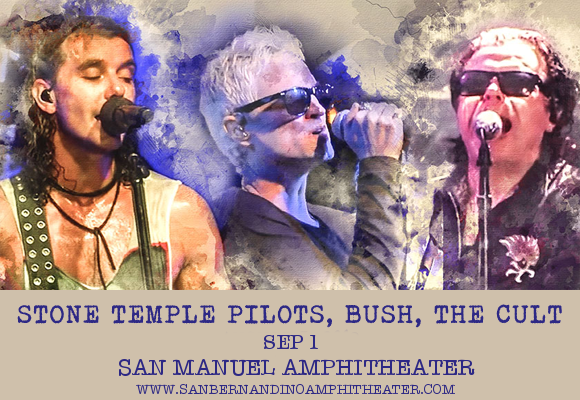 Grab your tickets to see The Cult, Stone Temple Pilots and Bush NOW while they last!! Formed in San Diego in 1989, the Stone Temple Pilots became known initially as part of the early grunge movement with their debut album “Core". With sales of over 13 million albums in the US and 35 million worldwide, the Stone Temple Pilots went on to become one of the most successful artists of the 90s. The Cult, formed in England in 1983, helped to define the sound of early goth rock with songs such as "She Sells Sanctuary" before breaking in America with the album “ Electric" featuring a more hard rock sound. As for Bush, they were an instant success with the release of their first album, "Sixteen Stone," which sold over 10 million records in the United States! They’re on tour with their most recent release, “White Rainbows" of 2017. Don’t miss your chance to see this fantastic trio of bands live – grab your tickets to see Bush, the Stone Temple Pilots and The Cult live TODAY, while stocks last!